Get to know Judy | Chics Take Flight! Judy was the committee chair and head organizer for Chics Take Flight 2012. For 2013, she’s taken on a supporting role. 1. What is your aviation background? I’ve always been fascinated with planes and flying but never thought I could do it. 2. What got you interested in soaring? 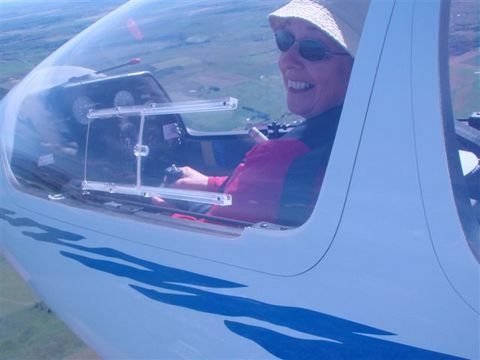 A picnic trip with my husband to Sheep River Falls on July 1, 2010 with an impromptu stop at Cu-Nim Gliding Club changed my life forever. I never thought that I could learn to fly and find so much joy. It is absolutely challenging to learn but I can honestly say that I have never had a bad flight. Short, yes, but never bad. To see an eagle soaring below you in a thermal or share a thermal with a couple of hawks is very special. Flying along in a wave is an experience that words can’t describe. To see and meet other women who share this passion is extraordinary. I have had so many memorable flights it’s hard to choose one that stands out. That said, the one that sticks in my brain is after last year’s Chics Take Flight. An instructor and I were in the club’s new DG1000 and were flying in formation in a wave alongside a couple of other members in the ASK21. Another pilot had left their iPhone in the cockpit of the DG, so my instructor and I took advantage of the opportunity to document this flight with pictures. I recall looking down at the green hills below me and the purple hues in the western sky as the sun was beginning to set. The few clouds were so close I could almost reach out to touch them. After over an hour we decided to land, more for me out of fatigue than because of change in flying conditions. It was a perfect ending to a perfect day. 4. Have you ever been scared while flying? Landing scares me. So little time to put it all together and there is only one chance to do it. You can’t go around and start over again. 5. Why do you think there aren’t many women in aviation? I think women perceive it still as a man’s “game” and they can’t do it and be successful. The expense is probably another reason and family life takes precedence over everything else. I’ve also heard women comment that it is too scary. Driving in the city is scary. When talking to women, I assure them that it is very safe. It is not an extreme sport. Also, there seems to be a perception that aviation is just about being a pilot. Aviation has many facets. I know of women in my chapter of Women in Aviation International who aren’t pilots but are involved in other aspects. One works with Vintage Wings of Canada, a couple more are in avionics, one is a flight attendant, one works with ATC and we even have an 79 year old lady with a PhD in Psychology who is none of those but just loves to fly in “big planes”. She loves socializing with us and enjoys listening to us when we talk “prop talk”. Lastly, when I think about those women who ferried planes overseas during the war, it was a remarkable feat! But we don’t hear much about that. I think, for whatever reason, we haven’t done a good enough job to increase the awareness among women that we can do this and do it well. 6. Why should there be more? Women can contribute tremendously to aviation in many ways. Instruction is one area that we need women. We think and learn differently than men and sometimes there can be a conflict which may result in frustration for both parties. In my case, it can go either way. All the instructors at my club are all men and there a few that I have trouble learning from which is challenging for both of us. There are a couple who really connect with me. My husband used to be a flight instructor and he has been teaching me some things on a flight sim we have. I totally get it with him. One story he shared with me was there was an older woman (50s+ and a nurse – like me) who was learning to fly. All the instructors gave up on her because she just wasn’t catching on. My husband took on the challenge and she was able to learn from him. She got her license and went on to join the ’99s. She is an inspiration to me and I would love to meet her someday if I could ever find her. She is not the only one. I have met a remarkable woman who is also an inspiration. She is Val Deschamps this year’s Chairperson for Chics Take Flight. I want to be like her when I grow up! 7. How long have you been a pilot? About 2 years…still a student but had to take a sabbatical this year because of “life” getting in the way of flying. 8. What is the most important safety aspect, in your opinion? Be alert. Be on your game. Check, check and check again. Don’t ignore that niggling feeling in your gut that something is amiss. Starting over is not wrong.